For Fashionistas, the September Glossy Box is the one for you. The box is designed by Karen Millen and the goodies inside are the essentials that you need to getting a glossy makeover, whether that’s plumped and glowing skin, groomed brows or soft shiny hair. The box itself is beautiful – definitely my favourite design so far, and there is even a £25 Karen Millen voucher inside too! 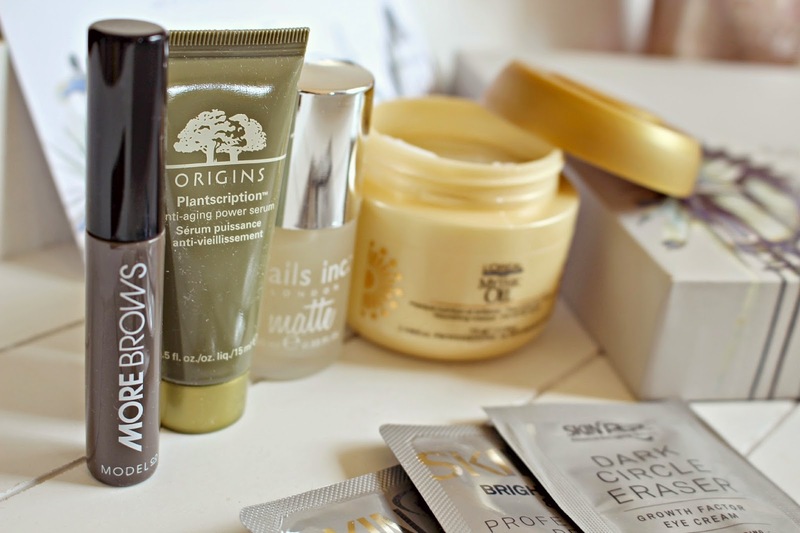 The beauty products are from well known brands including Origins, L’Oreal, ModelCo and Nails Ince, as well as a brand I hadn’t heard of – Skin Pep. The ModelCo More Brows reminds me of Benefit Gimme Brow – it’s highly pigmented so could be a little dark for blondes, but I use it as a setting gel after filling brows in with a lighter blonde pencil. It’s great when you do want a little more depth to your brows than a standard clear gel. I already have a few Matte Nail varnishes, but this Nails Inc one is great as you can use it to paint over any nail shade – I might try a Matte Berry if this chilly weather continues! I’m yet to try the Skin Pep Brighting Peel Gel or Dark Circle Eraser, but they both sound promising and I’m really loving peeling products at the moment, my skin constantly feels much smoother thanks to the masks I’ve been using recently (notably the Merumaya Skin Brightening Exfoliating Peel (review here) but i’ll let you know how these compare. The Origins Plantscription Serum is a key product for anyone concerned with premature ageing of the skin – it feels almost siliconey (in a nice way) when you apply it, and it promises to give skin a more youthful appearance by smoothing fine lines and wrinkles and having a pluming effect. The final product, and one which always comes in handy, is the L’Oreal Mystic Oil hair Masque. I used this for 3 minutes this morning, covering the ends of my hair, and I found my hair easier to comb through, and softer to touch so I think i’ll treat myself to a full size version when I run out! The Glossy Box subscription is £10.00 per month, you can sign up via their website here.